One of the main reasons Sony ditched the "George Foreman" build of the PS3 and went with the new "Slim" was to cut back on manufacturing costs. Try and get back into the black. But they're not quite there. 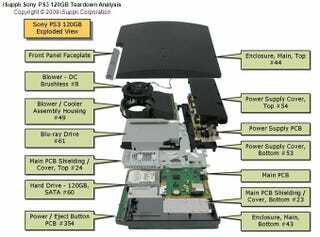 According to a report on iSuppli - who have been doing this kind of thing for a while now - the total cost of manufacturing a PS3 Slim as of December 2009 is $336.27. And they sell for $299. Meaning Sony are still slugged with a $37 loss for every console sold. Sounds bad - and when you multiply that $37 by millions, it certainly seems that way - but it's a damn sight less money than they were losing this time last year. With the cost of materials continually on the decline, provided Sony can stick at a $299 price point for a while to come, you'd expect the PS3 to start generating a profit sometime next year.